My “premiere” happened during the same year as one of my favorite movies, The Third Man. I was lucky to have experienced films in some very beautiful movie palaces–regrettably many of them are gone. Theaters with ushers and screens with curtains that opened and closed. Theaters with no commercials! I was around for the heyday of drive-ins, and when 3-D, Cinerama, Vistavision and Cinemascope were the latest things. I was dropped-off at many all-day Saturday cartoon extravaganzas, too. Favorite film: North By Northwest. Recent favorites: Gravity, Grand Budapest Hotel, Inside Llewyn Davis. For me, watching a film with others, be it in a theater or cozy at home on the couch, is almost a near-perfect experience. There’s a convergence of being alone while not being alone, of being in a dream while not being in a dream, of entering others’ lives while taking a break from your own. Most importantly, movies make my brain happy. I clearly remember the ritual of going to the movies with my family on Thursday nights and how we always stopped at the Hammond, Indiana, White Castle afterwards. We would eat sitting in the car, with my parents in the front seat and my sister and I in the back, passing the bag filled with our stack of hamburgers and talking about the movie we just saw. In summer, the car windows would be open and in winter, they would be all steamed up and foggy. It was more than a movie night; it was a total experience. Professionally, I’ve been an editor, a teacher, and an association manager, but I mostly have aspired to be a writer. I wrote a novel many years ago — a love story about women who are childless by choice and very satisfied with that decision — and I’m currently working on a collection of short stories. (Shameless self-promotion: My novel, Human Slices, is available in print and via Kindle at amazon.com). 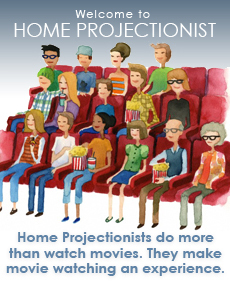 I’m excited to be part of the HomeProjectionist community. We have so much to talk about. Lindsay Edmunds blogs about robots, writing, life in southwestern Pennsylvania, and sometimes books and movies at Writer’s Rest. She is the author of a novel about love in the age of artificial intelligence: Cel & Anna. Movies bond people together. They mark your place in life, when you saw it, who you saw it with, who you were when you saw it. Sharing movies with friends is a natural. Most people don’t do it enough or they take watching as a passive experience when it should be a reason for an evening; not just to kill time until its time for bed. I have been having people over for watching parties for over ten years. I’ve learned the hard way what does and doesn’t work with crowds of people gathered around a tube or a projector screen. I’ve shown some things that where bombs; and some nights where the movie and the friends bended into a magical evening. In either case, it has been a great way to make new friends, bond with the ones I have, and watch some great movies in an environment of camaraderie. Through the years I have worked as a Frank Sinatra Impersonator, fronted a band, “Bric-a-Brac and contributor to the Ira Glass hosted radio show This American Life. I have been using projection systems for nearly 8 years.